His father was a municipal counselor, and his mother known for her piety. Raised in the Orthodox Ruthenian Church which, on 23 November 1595 in the Union of Brest, united with the Church of Rome. Trained as a merchant's apprentice at Vilna, Lithuania, he was offered partnership in the business, and marriage to his partner's daughter; feeling the call to religious life, he declined both. Monk in the Ukrainian Order of Saint Basil (Basilians) in Vilna at age 20 in 1604, taking the name Brother Josaphat. Deacon. Ordained a Byzantine rite priest in 1609. Josaphat's superior, Samuel, never accepted unity with Rome, and looked for a way to fight against Roman Catholicism and the Uniats, the name given those who brought about and accepted the union of the Churches. Learning of Samuel's work, and fearing the physical and spiritual damage it could cause, Josaphat brought it to the attention of his superiors. The archbishop of Kiev, Ukraine, removed Samuel from his post, replacing him with Josaphat. He became a famous preacher. Worked to bring unity among the faithful, and bring strayed Christians back to the Church. Bishop of Vitebsk, Belarus. Most religious, fearing interference with the natively developed liturgy and customs, did not want union with Rome. Bishop Josaphat believed unity to be in the best interests of the Church, and by teaching, clerical reform, and personal example Josaphat won the greater part of the Orthodox in Lithuania to the union. Never completely suitable to either side, Roman authorities sometimes raised objection to Josaphat's Orthodox actions. Consecrated as Archbishop of Polotsk, Lithuania in 1617. While Josaphat attended the Diet of Warsaw in 1620, a dissident group, supported by Cossacks, set up an anti-Uniat bishops for each Uniat one, spread the accusation that Josaphat had "gone Latin," and that his followers would be forced to do the same, and placed a usurper on the archbishop's chair. Despite warnings, John went to Vitebsk, a hotbed of trouble, to try to correct the misunderstandings, and settle disturbances. The army remained loyal to the king, who remained loyal to the Union, and so the army tried to protect Josaphat and his clergy. Late in 1623 an anti-Uniat priest named Elias shouted insults at Josaphat from his own courtyard, and tried to force his way into the residence. When he was removed, a mob assembled and forced his release. Mob mentality took over, and they invaded the residence. Josaphat tried to insure the safety of his servants before fleeing himself, but did not get out in time, and was martyred by the mob. His death was a shock to both sides of the dispute, brought some sanity and a cooling off period to both sides of the conflict. Educated in a monastery. Benedictine monk at Ripon, England. Priest. Missionary to the Netherlands, following in the path of Saint Boniface, beginning in Utrecht. He worked with Saint Marchelm and Saint Gregory of Utrecht. Preached in the districts along the Yssel River. Established the first church in Deventer, Netherlands and used it as a base for missionary work to the Saxons and Frisians. His success caused great hostility among the non-converted pagans who burned his church and spread the rumour that his success was due to witchcraft. Lebuin took his message to the Saxon national assembly, preaching the Gospel during a sacrifice to one of the pagan gods, and prophesying the destruction of their nation if they did not convert. Many of the representatives wanted to kill him, but one spoke up to say that the assembly should treat him as an ambassador from God, and give him the same diplomatic protection. The Saxons agreed, and agreed to respect the rights of Christianity. Monk in Rome, Italy, taking the name Astricus. Friend of Saint Adalbert of Prague, and assisted Adalbert on his missionary work in Bohemia. First abbot of Brevnov. Due to anti-Christian persecution in the region, he had to flee to Hungary. Worked as a missionary to the Magyars. Spiritual teacher to the wife of Duke Geza, the mother of Saint Stephen of Hungary, in 997. First abbot of Saint Martin's monastery in Pannonhalma, the first monastery in Hungary, a house founded by Duke Geza. When Saint Stephen succeeded his father Geza as duke, Anastasius renewed his evangelization work with the Magyars. First archbishop of the Hungarian Church with his see city probably at Kalocsa. He was sent as ambassador to Rome, and negotiated the recognition of the new kingdom of Hungary by Pope Sylvester II. He transported the crown that the pope gave for Stephen to be crowned as King of the Hungarians by Emperor Otto III in 1001. Advisor to Stephen on matters of spirit and state until Stephen's death. He outlived Stephen by two years, and spent those last days as a prayerful monk. Didacus loved and felt drawn to the solitary life from his youth, and when still young he became a hermit who supported himself by weaving mats. Franciscan lay-brother at the convent of Arizafa. Though he lacked a formal education, he was sought out for his insights into the Christian life. Sent as a missionary to the Canary Islands in 1442, he went with the belief that he would be martyred. Superior of the community at Fuerteventura, Spain. Converted many by his preaching and example, and returned unharmed to Spain in 1449. Sent to Rome, Italy in 1450 for the canonization of Saint Bernardine of Siena. An epidemic broke out among the gathered Franciscans, and Didacus worked himself to exhaustion to help his brothers; reported to have miraculously cured many of the sick. He then returned to Spain and spent the rest of his life as a prayerful at Alcala. Byzantine imperial official; may even have been a Praetorian Prefect. Married and father of two. When the children were grown, Nilus and the wife agreed to lead separate lives devoted to God. Monk on Mount Sinai with his son Theodulus. After a few years on the Mount, Arab raiders kidnapped Theodulus. Nilus went in search of him and found him in Eleusa in Palestine where the bishop had ransomed him out of slavery and made him the door-keeper of his church. The bishop ordained them both, and the returned to Sinai. Noted author on theological matters, his works influenced the Eastern Church. Bishop of Ancyra. Friend, supporter and spiritual student of Saint John Chrystostom. 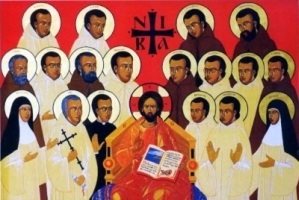 They weren't Polish, and they weren't related, but were instead five Italian Benedictine monks who worked with Saint Adalbert of Prague as missionaries to the Slavs, and were martyred together. They were - Benedict, Christinus, Isaac, John and Matthew. Born to the Frankish nobility. Archdeacon of Trier, Germany. Archbishop of Cologne, Germany in 627. Spiritual teacher and advisor to Saint Sigebert III, and co-regent of Austrasia. Known as a great builder of churches and monasteries in his diocese. Legend says that a dove led him to the lost grave of Saint Ursula. Son of a Scottish nobleman and an Irish princess, he was raised in Ireland, and studied there and in England. Ordained by Saint Augustine of Canterbury. Highly successful missionary to Flanders, Belgium with three companions. Bishop of Ghent, Belgium. Tortured by pagans, his tongue was torn out to stop his preaching; legend says tongue continued to preach on its own. Martyr. Born to a poor farm family. Worked as a shepherd in La Rioja, Spain. Hermit. Priest. Parish priest in Berceo, Spain for some time, but eventually returned to his life as a hermit. His reputation for holiness spread, a large number of would-be spritual students gathered around him, and he agreed to lead them. With them he founded the monastery of La Cogolla, and served as its first abbot. Cistercian nun in the Congregation of Saint Bernard of Spain. Martyred in the Spanish Civil War. May have been a spiritual student of Saint Ambrose of Milan; may have been a bishop of Milan, Italy; may have served in the 4th or 6th century; may have been a martyr. Nothing sure about his life has survived. Soldier. Franciscan tertiary in 1396. Founded several charitable organizations and a confraternity of flagellants. Priest of the diocese of Chilpancingo, Mexico. Martyr. Married layman in the archdiocese of Valencia, Spain. Member of Catholic Action. Martyred in the Spanish Civil War. Baptized by Saint Colman. Spiritual student of Saint Columba at Iona Abbey. Bishop of Aberdeen, Scotland. Missionary to the Picts with twelve companions. Columban monk in Clonfert, Ireland. Founded a monastery at the area which became known as Kilcummin in his honour, and served as its abbot. Supported the Roman system of determining the date of Easter, a matter of great dispute at the time. Monk at Cessier, France. Monk at Saint-Pierre-le-Vif near Sens, France. Martyr. After a career as a soldier, he retired from the world to become a hermit near Marcillac, France. Monk at Reculver Abbey, Kent, England. Martyr. A pious king in Wales. Bishop. Wrote in opposition to the Montanist heresy. Martyr. First bishop of Avignon, France. Bishop of Le Puy, France.